We just packed up an Airbnb that we have been living in for three months in Los Angeles and are heading back east. This is a photo of my carry on luggage as I was packing it this morning. 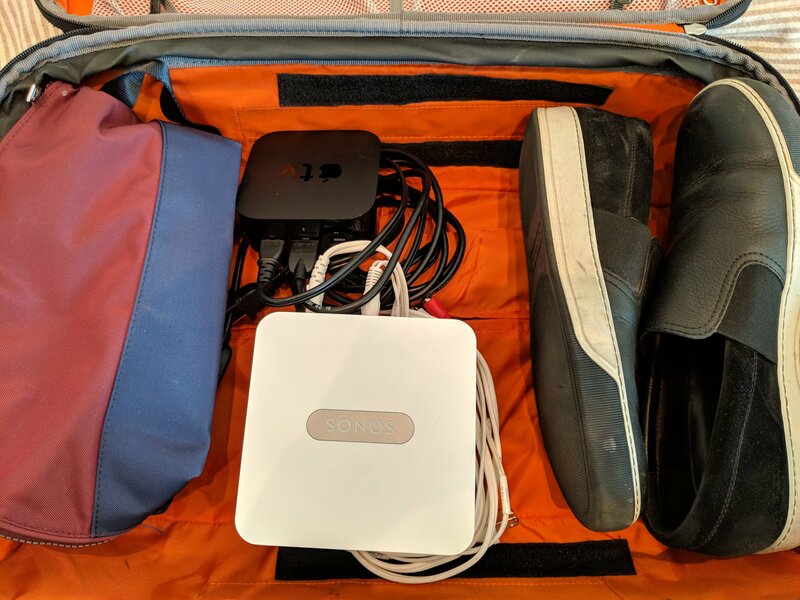 That is an AppleTV and a Sonos Connect in between my “shaving kit” and my sneakers. I brought these two devices out west and connected the AppleTV to the one TV in the Airbnb and I connected the Sonos to the receiver that powered the in ceiling speakers in the main living space in the house. Even if the Airbnb had come with an AppleTV and a Sonos device, I would have swapped out theirs for ours for the length of our stay because these two devices have all of our services pre-confgured on them and we are logged into all of the services. That is where the big difference is for me and the reason it is worth schlepping these devices cross country and back. The devices aren’t crazy expensive. The AppleTV is around $150 and the Sonos Connect is around $300. But setting these devices up, connecting them to all of the various services we subscribe to, and logging into each and every one can be an hour or more of work each time you do it. All I had to do was power them up, connect to wifi, and connect to the TV and/or the receiver, and we were good to go. It’s kind of magic to have all of your services right there on the device, organized how you like them, and ready to go. I have friends who do the AppleTV move in hotels when they travel for business. I haven’t gone that far but I might leave the AppleTV in my carry on luggage along with my shaving kit and try that on my next business trip. Plugging in an HDMI cable into a TV is pretty straightforward in most cases. What this means is TV and music is now highly portable. You can bring your TV and music with you when you travel and connect into the existing infrastructure in your hotel or Airbnb. If these devices get small enough or cheap enough (or both), or if our smartphones can replicate all of the functionality of these devices, then the hospitality industry can focus on the “dumb” infrastructure and the guests can bring the smart devices.